Passport Photo Maker is a professional application for making ID photos that comply with the official requirements. 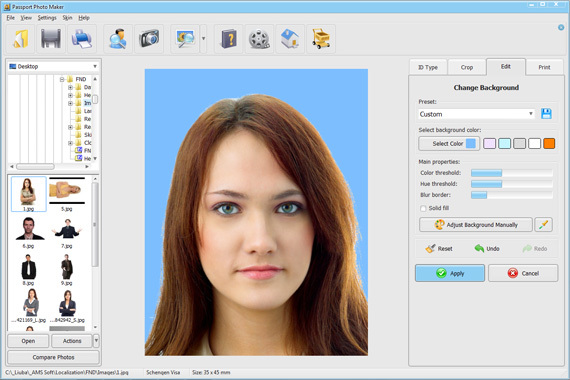 Biometric features detection, advanced image processing modules, an extensive photo editing toolkit, and high quality print output make this ID photo software a convenient tool both for home users and for professional photographers. The integrated photo editor provides the tools needed to fix colors and shadows and adjust levels, change the photo background with a few mouse clicks, and replace clothes on the photo. When the photo is ready for export, the user can save it to file for online submission, or print the necessary number of photos on any paper type. Photo businesses can add their address and logo to the print layout. It is also possible to create reusable print layout templates to speed up printing photos for clients.